Approximately two-thirds of the total iron in our bodies can be found in the oxygen-carrying protein of red blood cells known as hemoglobin, according to the National Institutes of Health Office of Dietary Supplements. Failure to consume enough iron to keep iron stores in the body high can cause iron-deficiency anemia, a condition characterized by a low number of red blood cells. To diagnose iron-deficiency anemia, doctors take a sample of blood and run a variety of tests that work together to determine the amount of iron in the blood and its ability to function. 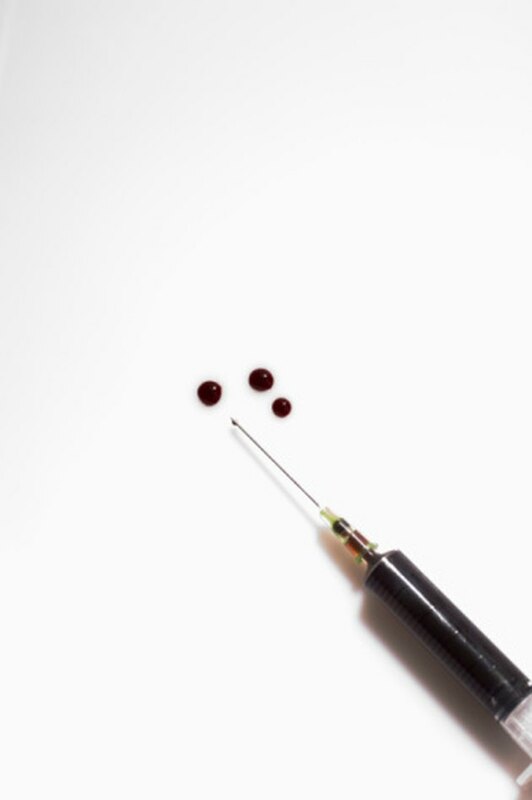 A serum iron test determines the amount of iron in the liquid portion of the blood. Because the amount of iron in the blood varies throughout the day, experts at Lab Tests Online recommend performing iron testing the first thing in the morning. A normal range for iron in the blood, as reported by MedlinePlus, is 60mcg/dL to 170 mcg/dL. Iron levels less than that may indicate blood loss through gastrointestinal bleeding or heavy menstruation, poor iron absorption, pregnancy or failure to consume enough dietary iron. Low serum iron levels provide one indication of iron-deficiency anemia. When doctors order a serum iron test, they usually also order a Total Iron Binding Capacity test, called a TIBC. A TIBC test helps determine whether the blood carries too little or too much iron. Iron travels through the liquid portion of the blood bound to the protein known as transferrin. When they use it with the Serum Iron test, doctors can determine the transferrin saturation, a useful indicator of the iron status in the blood. A TIBC test should range from 240mcg/dL to 450 mcg/dL resulting in a normal transferrin saturation range of 20 percent to 50 percent. The human body retains and reuses up to 90 percent of the total amount of iron, according to the Mayo Clinic. Of the one-third of iron not found in hemoglobin, most of it binds to the protein ferritin and gets stored in the liver, bone marrow, spleen and muscles. As blood iron levels become low, the stored iron also decreases, causing ferritin levels to drop. For women, serum ferritin normally ranges from 12 to 150 ng/dL while men range from 12ng/dL to 300ng/dL, or nanograms per deciliter. The lower the number, even within the normal range, the more likely your iron level is low. Because most of the iron in the body occurs in hemoglobin, determining the amount of hemoglobin helps determine the amount of iron in the blood. MayoClinic.com says normal hemoglobin ranges from 11.1g/dL to 15g/dL. Results lower than that indicate an iron deficiency causing anemia. The blood also contains white blood cells and platelets. When testing the blood for iron levels to determine the presence and cause of anemia, it's important to determine the percentage of red blood cells in the total blood volume, a test known as a hematocrit. A normal hematocrit result ranges from 34.9 percent to 44.5 percent for women and 38.8 percent to 50 percent for men. What Is a Normal Iron Level in a Toddler?